The trees stop as suddenly as they started, and before me the white lock-house of Goring Lock provides a clear focal-point. It stands gleaming and demanding attention, perfectly framed by the surrounding hills. I have arrived at the Goring Gap. On its journey to find the sea, the Thames came upon the Chiltern Hills and Berkshire Downs that combined to form a barrier to its progress. “Hmm”, said the river, “I can’t go over the top. On the other hand it is a long way round. Just have to bash my way through then”. And so it did. 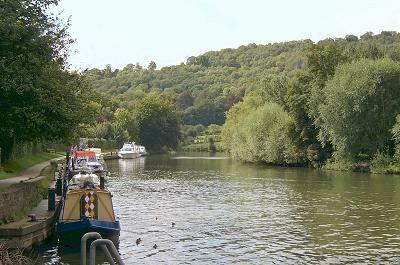 Geographers may not quite see it that way, but however it really happened over the course of ages, we are left today with the picturesque villages of Streatley and Goring nestling in the gap formed by the river flowing between the two sets of hills. 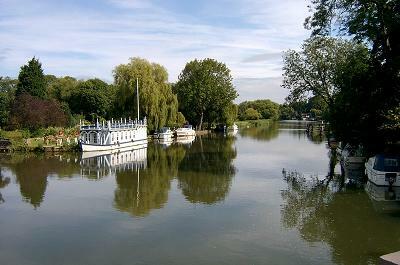 Streatley and Goring date back further than many first imagine. Here the inhabitants may sneer at references to the Domesday Book whence other places are proud to derive their earliest routes. There is evidence of a Neolithic settlement from the discovery of stone-age tools, and it is believed that this was an important crossing point for those very early residents of southern England. 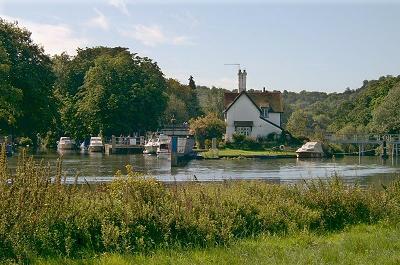 The ancient tracks of The Ridgeway and Icknield Way meet at the Goring side of the river and the travellers would have been able to make a crossing here if water levels permitted. The Romans definitely had a presence here, for an old Roman milestone still stands at the Bull crossroads. The Bull, inevitably, was mentioned by “you-know-who”, but there is a far more interesting part to the Bull’s history. The garden is the burial place of a monk and a nun who were executed in 1440 for “misconduct”. Whether the nun had been previously trained at Godstow Nunnery is not known. 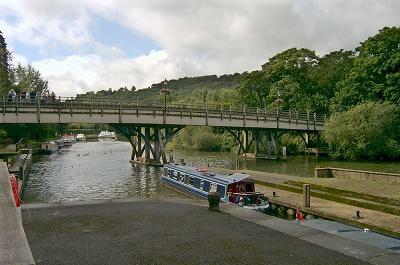 The current bridge was completed in 1923 and replaced the original timber bridge built in 1837. Before this river crossings were by ferry. There are reports of a ferry disaster in 1674 when a ferryboat capsized in the flash lock and sixty passengers were drowned. The towpath below Goring is narrow and muddy. I have to pick my way carefully along it because it has been made very slippery by the rains of the last few days. After about a mile the Thames Path takes an inland detour to Whitchurch-on-Thames. The path climbs steeply, offering some superior views down to the river, and then sweeps into Hartslock Wood. This is typical Chilterns woodland, the path bobs up and down as it threads through the broadleaved trees, working its way around the hill, finally delivering me to a narrow lane that descends once more to the riverside and the charming village of Whitchurch-on-Thames.